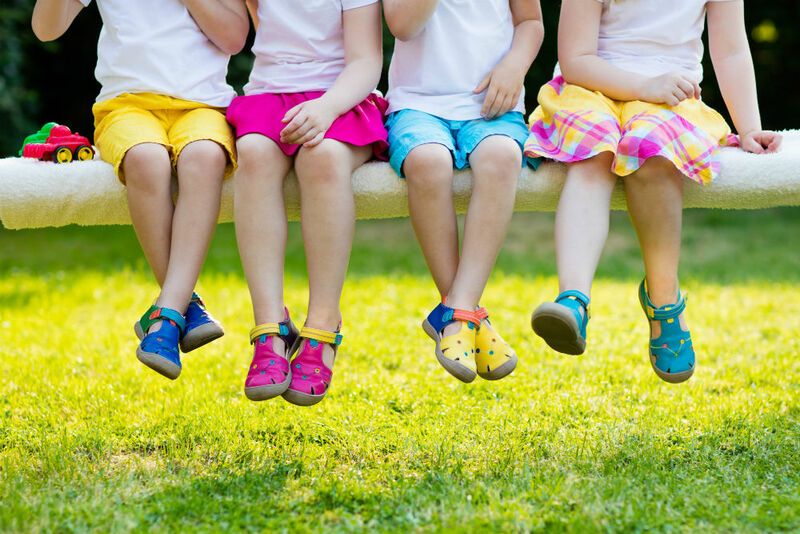 Well, every time is a good time to think about children’s foot health, of course. At least in our opinion. But back-to-school activities and sports—and newly increased contact with other kids—make some kids particularly susceptible to various injuries and diseases this time of year. Want to keep your little one’s feet in top shape? Here are a few key tips to keep in mind. A huge part of keeping little feet safe, healthy, and pain-free is making sure you shod them appropriately. Shoes can make or break it for a child. Good ones provide effective support, cushioning, comfort, and stability. Bad ones can cause pain, injury, blisters, and even abnormal foot development. Here’s your roadmap to finding and fitting them. They need to fit. This is admittedly a pain point for many parents, since kids who are very young or going through a growth spurt might outgrow their shoes 3-4 times per year (or more)—potentially faster than the shoes themselves wear out. However, don’t give in to the temptation to buy shoes that are too big in the hopes that your child will “grow into” them and get more use out of them. Shoes that are too loose can be just as bad in terms of causing pain, injury, and skin irritation as shoes that are too small. Shoes should be sport-specific and activity-appropriate. To a certain degree, this is obvious—you wouldn’t play sports in heels, right? Well, what isn’t so obvious is that you shouldn’t play a sport in a different sport’s shoes, either. In other words, if you child makes the cross-country team, they should have trail running shoes—not just any old sneakers. Likewise, don’t try to reuse soccer cleats for football, or vice versa. Consider setting up a shoe rotation. Stop us if you’ve heard this one: kids sometimes have stinky feet. Damp shoes can become a breeding ground for fungal infections and odor-causing microorganisms. If your little one is developing adverse skin conditions on their feet, you might consider having them rotate between pairs of shoes every other day. This allows each pair to dry out fully before your child puts them on again. That last point gives us a good jumping-off spot to talk about foot hygiene more generally. Teach your children how to properly clean and care for their skin and nails—these habits will serve them well not only during their formative years, but in the years to come! Wash and dry thoroughly. Kids should ordinarily be bathing or showering daily, and when they do, they should not ignore their feet! This simple act is a major deterrent for fungi, bacteria, and other infecting agents. After bathing, your little one should dry their feet thoroughly before putting socks or shoes back on—don’t forget the spaces between the toes, either! Cut toenails properly. Poor nail trimming habits increase the risk of painful ingrown toenails, especially if your child plays a sport or is wearing improper shoes. Teach your children to cut their toenails straight across, rather than rounding the corners. Additionally, have them keep their toenails at “goldilocks” length—not super short, but not too long either. (Even with the toe tip is good.) Finally, kids should have their own set of toenail clippers. These are bigger and have more leverage than fingernail trimmers, and make a straighter cut. Not sharing them with others in the family reduces the risk of fungal transmission. Here’s an unfortunate truth. Kids sometimes have their own ideas about what to tell mom and dad—and what not to tell them. Hopefully, if their feet are hurting they’ll come to you. But then again, they might not—especially if they’re worried that reporting an injury is going to force them to go to the doctor or prevent them from playing with their friends and teammates. Your child is limping, “walking funny,” or is constantly tripping over themselves. Your child suddenly loses in interest in active play and sports or games that they used to enjoy. It could be that stress or overuse are causing heel pain, fatigued legs, or other problems. You notice cuts, calluses, blisters, swelling, or other problems with their feet. Childhood foot problems that last more than a few days, despite resting, really need to be evaluated by a professional. The good news is that children’s foot issues rarely require invasive procedures such as surgery. However, it is always best to deal with foot and ankle injuries and conditions as quickly as possible. If there is an underlying structural problem (for example, flat feet or a gait abnormality) it is far better to address it before adulthood. We hope that your child has a healthy, happy return to school this fall! As always, we love working with kids of all ages, so if you or a loved one need to schedule an appointment, give us a call at (203) 876-7736 today.